Firstly, I want to thank all of you who have been following along with the Colette Book Club. It has been really fun to read and discuss sewing related books with all of you. I love that as sewists, our obsession always finds a way to reach beyond the sewing room and creep into other aspects of our lives. Unfortunately, this edition of the Colette Book Club will be the last. I want to thank you again for following along and reading with us! 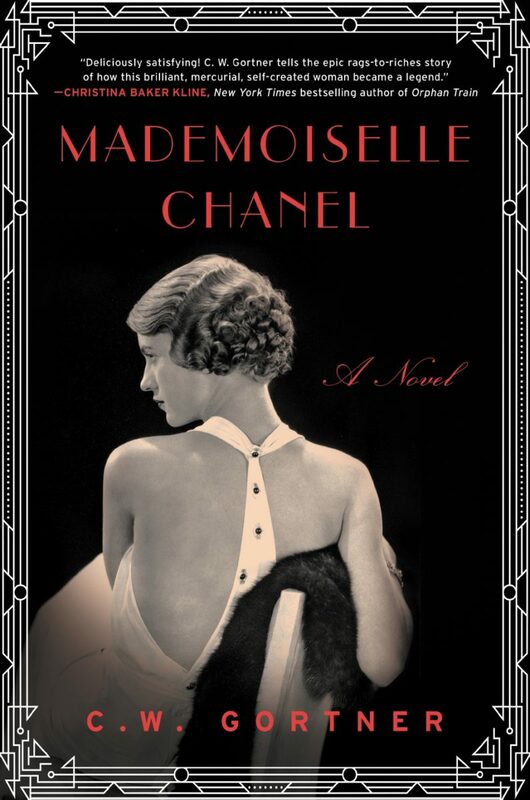 Did you read Mademoiselle Chanel by CW Gortner? Coco Chanel’s rags-to-riches tale has been told time and time again, and with good reason. Chanel was a woman ahead of her time, both in terms of taste, and the way in which she lived her life. Though Chanel is largely responsible for what we acknowledge as modern womenswear, she was a particularly unlikable character in real life. In this fictionalized autobiography, Gortner attempts to humanize his idol and the woman who is synonymous with modern fashion. Though this novel touches on many periods of Chanel’s life and work, its broad subject doesn’t stop the author from painting a detailed portrait. My take on the book, this tale kept me interested despite the fact that I am pretty well-acquainted with both Chanel’s personal and professional life. I did feel that this book sugar coated Chanel’s Nazi sympathy during WWII along with other unadmirable aspects of her life. How does this book’s view of Chanel differ from the generally accepted one or your own? Did you feel that Gortner’s portrayal of Chanel was biased? Were their aspects of Chanel’s life that you were surprised by? Vogue wrote that “Chanel’s little black dress will become standard for the masses, much like Ford’s motorcars.” Why do you think that particular garment has become such an enduring classic? First I’ve heard of this book; thanx for review. The quote from the book seems a bit over-the-top. Won’t be buying it but will watch for it in my Library, or for a WSJ review. Their reviews are a great way to get the gist without reading entire ? I feel like Colette is gojng through a lot of changes. Please don’t throw the baby out with the bathwater. The book club is great…maybe seasonal or annual returnswould suit you better? I loved the book club choices. Thanks for the feedback! We will definitely keep a quarterly list of suggested reading in mind for the future! I have not participated in the discussions, but avidly follow the recommendations. I have purchased almost all of the books and love this resource. Please at the very least, continue the recommendations! I couldn’t get into the last book, but this one swallowed me immediately. Since I had no previous knowledge of her WWII experiences I cannot judge or even guess what really happened. My father was in the army and as a teenager I lived in Germany just 20 years after the war. After seeing the devastation from the war I can still be sympathetic for people who did what they had to in order to survive. How can a book not be biased knowing the way Gortner feels about Coco. I was surprised that Chanel never settled down with one man (marry). Carrer women are common place now. It wouldn’t have been then. I was also surprised and saddened by her home life. It amazes me how she rose above it all. I think Vogue was intuitive enough to realize the “little black dress” could be worn by any woman. I think it’s a classic because of it’s simplicity too. I disagree with the comment that Colette should stick to sewing. Growth is good. I can’t think of a better combination than reading about what you enjoy. I’m learning to knit and am reading a great book about people’s experiences, men and women alike, with knitting. It’s called Knitting Yarns. It keeps me connected to knitting even on the most frustrating day. As a beginning sewer this was what Gortner’s book did for me: inspired me to become better. I’ve read the books but haven’t participated via comments. I really enjoy reading books I would have never picked myself. A quarterly selection would work better for me than a new book every month. I vote for keeping the book club. Let me know if I can do anything to prod you to that end! Hi Marie, See my responses above! I have not read the book yet, I did not see this book club selection on the blog, but I have been interested in previous book club selections as they increase your knowledge of the apparel industry in general, not just home sewing. One aspect of Chanel’s life that interests me is that she began designing women’s wear during WWI with knit fabric. Does anyone know where to find more pictures of these styles? I would like to draft some copies but have only ever found grainy pictures that do not show any details. I think she should be known for more that just her tweedy suits though I do like them. I do not know why her black dress from 1926 is considered a classic, I don’t think it is flattering myself. As an RN I have taken care of holocaust survivors, those with tattoos. I cannot get past the fact that Coco was a Nazi sympathizer. This is not a matter of not enjoying her style due to difference in taste, this was life and death. There were many brave women of that time who did not sympathize with Nazi’s and many who actually went a step further in aiding Jews who were hiding. I know some folks feel we should not judge others if we ourselves were not there but seriously, this is one of those instances in which evil people slaughtered 6 million innocent victims and it is one in which I will judge. I cannot say what I would have done at that time but sympathizing with the Nazis and in articular their officers would not have been one of them. With that in mind I cannot appreciate her fashion work; having an item of her design in my wardrobe is unthinkable for me. I am of mixed Native American descent and am very much touched by issues of genocide and unwilling to offer special consideration to a Nazi sympathizer just because she is considered a renown fashion designer. That being said, reading is always good. Refusing to wear or sew her designs is not the same as refusing to study her life and legacy.I have read several accounts of her. Studying history is imperative to attempting not to fall victim to the atrocities similar to those of the past. Please reconsider the book club closing, reading is good. This was my favourite book from the book club. If you aren’t continuing the club, would you consider a “what we’re reading” list on the blog? I’ve enjoyed this feature from Colette Patterns! I think the LBD is a classic because it’s universally flattering and timeless. Since I’m not in the fashion industry I hadn’t read anything about Chanel until you’d suggested this book. Perhaps Gortner wanted to present a more sympathetic version of Chanel’s history because she was ahead of her time, not aligned with any of her generation’s traditional values. It was an engaging read for me. Now, I want to read a nonfiction book about her to learn more. Thanks for the recommendation! Please see my responses above! I had never read a fictionalized autobiography before and the use of the first person even though Chanel couldn’t participate or even comment was jarring at first. But I eventually had to admit that it is very engaging. I’m still uncomfortable with the idea that so many seemingly intimate moments had to be completely made up but overall I did enjoy the book. Very cool that Chanel was the first to bring jersey to women’s clothing. I am definitely very grateful for that innovation! I love that she not only was a deeply independent person but that she also worked to bring that sense of independence to other women by designing elegant clothes that didn’t restrict movement or sacrifice comfort. In general, reading about her ambition and focus was really inspiring to me. Naturally, I would have liked to learn more about the clothes she made and her design process. It sounds like even as her business grew, she retained a lot of or maybe even complete creative control over the general look of her garments and I wonder how she learned about garment fit and design over time. It sounds she did a lot of draping – was a lot of what she did intuitive? I guess I have some Googling to do, now! Please keep the book club. I haven’t commented, but have been reading along. It makes me feel connected to the sewing and Colette community. I’m verry sadden that’s colette book is doing to finish. I’ve read the books but haven’t participated via comments because my English is to bad.Keep the book club recommendations coming please ! I also avidly follow the book club recommendations and would love to see it continue in some form! Thanks Bonnie! The Colette Sewing Planner is definitely helping me stay more organized. I don’t know if I will ever get to the bottom of my stash, but I am going to try! I like the book club, too. I haven’t participated each month because I had a hard time getting the books and I understand how difficult it must be to find applicable titles, but I do think the idea of a sewing-themed book club is a very good one. As for Mademoiselle Chanel, I had a hard time reading it. It didn’t grab me and seemed to go on forever. I didn’t have any pre-knowledge of Chanel, other than she sold a famous perfume and was a designer at her height pre-1950, so I spent much of the book deciphering what was artistic addition and what was history. Because I have little background knowledge, I cannot comment on the first three questions. I do think I would have enjoyed the book more if there had been illustrations when the author described Chanel’s styles. As for the little black dress, I think people have come to accept black as simple and suitable for all occasions. It’s so much more comforting to know you can go shopping and if you have a black dress, you will be appropriate, or at least, not inappropriate, than to go shopping and have to decide between a multitude of color and style options. With the little black dress, there is less need for people to understand the social rules of what can be worn at what time of day and to which events. In that respect, the little black dress appeals to the United States’ sensibility of equality and discomfort with strict formality and hierarchy.